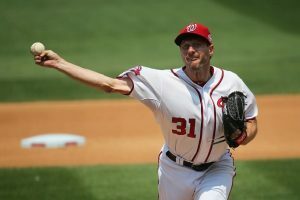 Max Scherzer. Game 5. Win or go home. You couldn’t sketch it any better for Mad Max. He loves this stuff. They’ll bring their best. We’ll bring our best. This is GREAT! Give me the ball! He doesn’t pretend that he didn’t give up two home runs on two mistake pitches in game one of this series. He doesn’t wallow in the team’s less-than stellar performances in their post season runs in 2012 and 2014, nor their fallout in the fall of 2015. He’s aware of it all, aware of the pressure, the stakes and the need for redemption. He wants to be the redeemer. And he’s got the potential. He’s pitched 2 no-hitters, and won 20 games this year while leading the majors in strikeouts and the national league in innings pitched. For these Nats he’s been a grounding force, going to work every 5th day in the pitching rotation. Some days he seems untouchable. Some days, as Washington Nationals color commentator FP Santangelo puts it, he brought his hard hat and his lunch pail to work. That’s why they brought him, or can we say, bought him to Washington. A cool $210 million to hire the guy who’s game face is so fierce, you know every nerve cell is on fire with every pitch. Just look at those eyes and you know it. So, with 100 billion or so nerve cells firing, that’s just fractions of pennies per pitch. He’s a bargain. If they win. At least that’s the hype. Everything is on the line. “This could change how past disappointments are viewed or reinforce the worst labels affixed to the franchise,” writes Adam Kilgore in today’s Washington Post. My own sensibilities don’t want to go there. I don’t want to add to the weight on the shoulders of the Washington Ace. He’s got enough pressure, taken on enough responsibility, born enough of the burden in tough conditions, made even tougher with Strasburg gone missing and battery-mate Wilson Ramos out with a season-ending knee injury. But my sensibilities are my own, having often floundered as humans are wont to do in situations where pressure got the best of me. But this man is different. He loves the pressure and thrives on the big game; he wants the ball when the chips are down and the stakes are high. Scherzer is a competitor of the highest order. He wants the best thrown at him so he can mow them down or die trying. That’s how he got to be an Ace. That’s what an Ace is. Come on. You’ve got to be inspired by a guy like that! And surely that Washington Nationals line up is. 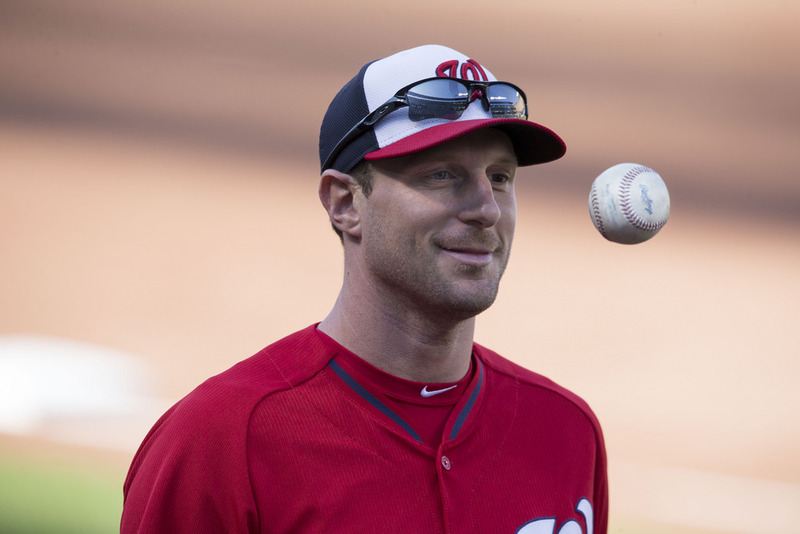 If you’re gonna walk through walls for someone, it’s gonna be someone like Max Scherzer. A guy who brings it – strikeouts and lunch pail – every single game, and would walk (or throw the baseball) through walls for you. But baseball isn’t a game of running through walls. 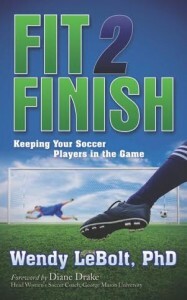 It’s a game of focus and finesse, skill and expertise, smart moves and counter-moves, great efforts and even greater plays. It’s a game of inches that’s measured in yards. There is sun and there are shadows, lucky bounces and bad hops. Anything can happen, and while we say ‘may the best team win,’ we hope that our team is best, be that good, lucky or both. That’s sports. That’s most certainly baseball. I guess it’s no wonder that baseball players are among the most superstitious of professional athletes. And why not call in all your resources on a game day like this? Max Scherzer is a great natural resource, especially under pressure. Let’s hope it’s the kind that makes diamonds. I’m backing Max. He makes no excuses and offers no apologies. He’s not focused on the past or predicting the future. He is a competitor. That’s what makes him an Ace. You can’t ask for more than that.